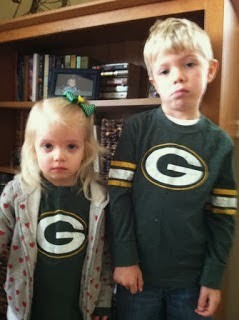 My little Packer Backers spent yet another Super Bowl Sunday protesting Green Bay's absence from the big game. The emotion in the first picture of this series (taken in 2012) was captured accidentally. On Super Bowl Sunday I brought out all of the kids' Green Bay gear for one more wear. As Will pulled on his Packer shirt, he asked excitedly if the Packers had made it to the Super Bowl. When I explained that no, the Packers weren't playing that day, the authentically forlorn expression you see above passed slowly across his face. Hallie, on the other hand, just didn't feel like smiling for the camera. Year after year, when the Packers once again miss out on the Super Bowl, I ask the kids to make the same grumpy faces they made that first year. Both pull out their turned-down mouths and furrowed brows (and occasional they bare their teeth) for the photo...the difference, however, is that while Hallie hangs on to her angry expression for as long as possible (she claims to be practicing for "mad face" contests), Will starts laughing as soon as the camera clicks. Some kids have staring contests…Hallie has mad face contests. And you know what? She's AMAZING at them. She beats me every single time. Yes, I'm looking into drama classes. This tradition of Will and Hallie wearing their disappointment on both their faces and torsos began in 2012 will continue as long as is necessary…hopefully 2017 will see our Green Bay Packers rise to the top once more. I love "the hallie face" - there's gotta be a trademark opportunity there somewhere!